We live in a connected world. Thanks to the technological advancement made by us over the recent past, it won’t be wrong to say we have managed to transform the world into a global village, where the sharing of information has become seamlessly easy. This rise in technology has brought a lot of changes in the way businesses were run in the past. From remote work to outsourcing, it has now become easy for business owners to break all geographical barriers and hire skilled professionals from any part of the world to work for them. Talking about outsourcing services, India has been leading the charge as the most preferred choice for organizations from all over the world. According to Nasscom, India accounted for 56% of the total Global IT-BPM for the year 2015. Recent stats further strengthen India’s stand as the outsourcing hub. One of the first things that stand in favor of India as the preferred destination PHP development is the fact that the country has got a really massive developer community, which continues to grow even stronger. You can be certain to find experienced PHP developers who are great at their job, and object-oriented. Unlike most of the non-English speaking countries, language is not a barrier when you are dealing with Indians. Most of the professionals offering outsourcing services from India are adept at communicating in English language. So, you don’t need to worry about language being a barrier when you hire someone to outsource your PHP development needs. Costing is one of the major reasons that make it a great choice to outsource PHP developers in India. Compared to other parts of the world, the wages in India are relatively low, so you can save yourself from paying exorbitant prices by choosing to outsource PHP development in India. And, these savings can be used for the benefit of your business, and you can invest them somewhere else. At the same time, you can expect to get a dedicated and skilled team of developers to understand your business requirements and come up with bespoke solutions. You won’t have to stress your mind, penning down every detail and playing the email volleyball back and forth with the developers. You can expect to get quality results delivered when you outsource your PHP developers in India. 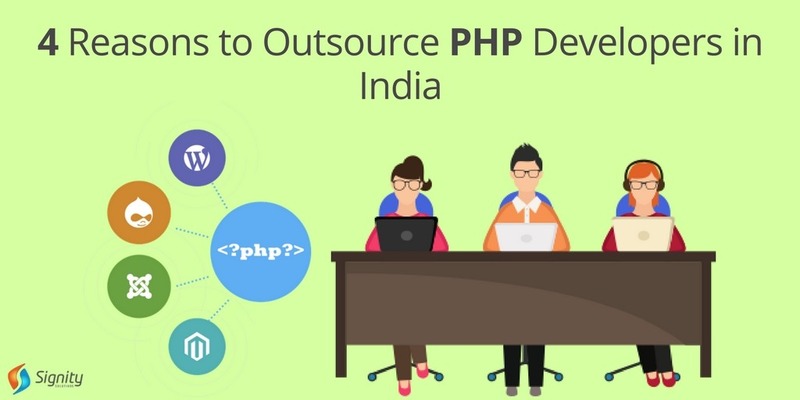 Leaving all these things aside, the one reason that makes outsourcing PHP developers in India such a good choice is the fact that it allows you to save on infrastructure and technology that you would have to otherwise invest in building an in-house team for doing the job. Rather than going through the drill and building another team that could take care of your web development needs, you can continue to focus on your core business process and grow. All these reasons paint a clear picture as to why it is a smart choice to outsource PHP developers in India. So, what are you waiting for? If you have been thinking about making your online presence felt, then go ahead and begin the search for PHP developers in India, and see what you can get! If you are looking for developers, your own team in India or some specific solution that is PHP based, just drop us a line at sales@signitysolutions.com. Ritika is the Head of Content, Social and Digital at Signity Solutions - one of the fastest growing companies offering award winning solutions across web, mobile and cloud. She is a positivist with a love for traveling, writing, singing and cooking. Writing being her first love, she’s been enjoying the writing experience since more than a decade by authoring write-ups about everything from technology, marketing, cloud to philosophy, philanthropy and traveling.